Here’s a beast of mower that will be sure to get the job done thanks to it’s powerful Briggs and Stratton engine and deep cutting deck to tackle different grass heights. Looks wise this mower is the business, and it’s features only serve to reinforce that impression. 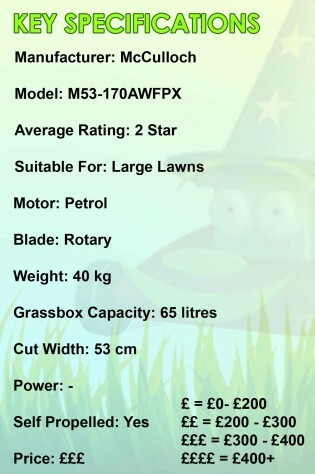 With a massive 46cm cutting width this mower is an excellent choice for cutting the lawn done quickly in a medium to large size garden, and the 50l grass box means that you won’t be emptying the grass every 5 minutes, meaning less time mowing and more time to spend enjoying your garden. Result. 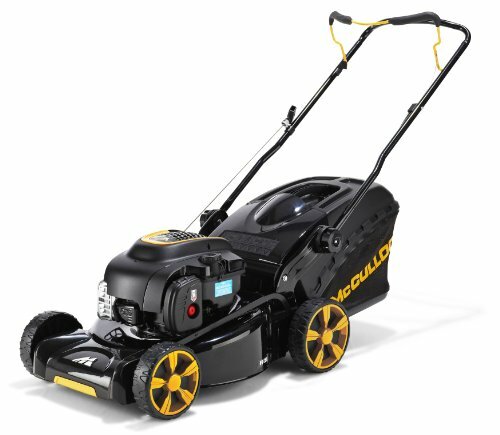 At increments between 20 – 75 cm, the cutting height of this mower can be set to cope with everything from a regularly and well-groomed lawn, to a veritable backyard jungle (almost!). One of the real stand out features of this mower has to be the ease with which it can be cleaned, thanks to the ‘Gardena’ water hose connector you can clean the underside of the cutting deck simply by attaching a hose to the specially designed inlet, without the hassle of breaking your back turning the mower on its side and causing damage to it as well as yourself. This isn’t a bad mower, indeed it’s one of the best petrol lawn mowers available from McCulloch, it’s got plenty of features you’d come to expect to ensure that it cuts the grass properly, as well as some more innovative ideas such as the hose connector that are actually pretty darn useful and make you wonder how no one had thought of them before. It’s a shame then that there are a few faults that let this mower down, such as the poorly considered relationship between the grass box size and the engine power, and the design of the cutting deck. 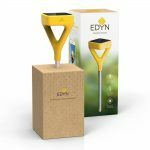 Certainly worth the money if you have a relatively flat lawn without any hard bumps or objects, but otherwise think very carefully.